Ahead of his performance with the English Chamber Orchestra next week, we caught up with violinist and CMF Alumnus Michael Foyle to talk about Prokofiev, dreaming and Mexico! Tell us something you’ve learned about Prokofiev whilst preparing to perform his 1st Violin Concerto? It is a great time to look into Prokofiev’s life as his diaries have just been published for the first time in English. They are wonderfully evocative, and real page-turners – he said himself that if he hadn’t composed music for a living, he would have used words instead – and they display the wit, fantasy and sarcasm that permeate all of his music. But they also show his gift for the lyrical and poetic that make their mark so compellingly in the First Violin Concerto. I suppose something I have learned from this reading is the extent of Prokofiev’s flair for theatrics. It comes across all the time in the diaries – he can make a mundane meeting with a publisher sound like a choreography for the Ballets russes!- and while playing his music I now see that this element of theatre is underlying even the most sensitive and intimate passages, as well as the exuberant and grotesque. Prokofiev was famously a pianist-composer – does he write well for the violin? Prokofiev’s compositions for violin contain some of the most idiomatic, and equally some of the most awkward, writing for the instrument of any composer – sometimes within one page! The Second Concerto is more muscular, rhythmic and more instantly accessible which is perhaps why it gets played more. But I find the First Concerto even more special; for me Prokofiev is one of the last strikingly original melodists, and he explores the lyrical nature of the instrument in the outer movements in a deeply personal way. Then the fiery and virtuosic extended techniques in the middle “Scherzo” make for one of the most dangerously thrilling movements of any Violin Concerto. Particularly enjoyable to explore in this Concerto is the sognando (dreaming) quality he asks for, even right at the opening – I’d love to find a really magical sound, so that even in a beautiful space like Cadogan Hall, an audience member might experience these incredibly tender and hushed phrases as if they are being played only for them. How did you come to play the violin? I started at the age of four and so don’t remember a time when I wasn’t playing! I was fascinated by a lot of subjects growing up but ultimately went on to study at Royal Academy of Music and Vienna Konservatorium. There is something about the sound of the violin to which I am so deeply connected that I can’t imagine life without it – the possibilities of repertoire, concert settings, and even the tonal inflections of a single note, are endlessly fascinating and rewarding. What has been a recent highlight for you in your career? Korngold wrote a Concerto that is suffused with lyricism in a different way – its opulent harmonies and luscious orchestration made it a tremendous pleasure to perform with two great orchestras this season- the Rotterdam Philharmonic and the Polish Baltic Philharmonic. 2018-19 season sees the release of two CDs with my Duo pianist and fellow CMF Artist, Maksim Stsura. A World War One centenary disc for Challenge Records, featuring the Sonatas of Debussy, Respighi and Janacek and a new commission by Kenneth Hesketh, will be released on Armistice Day, 11 November 2018, while February 2019 sees us release the complete duo works of Lutoslawski and Penderecki for Delphian Records. Both releases will be marked with recitals around the UK so please do come along! 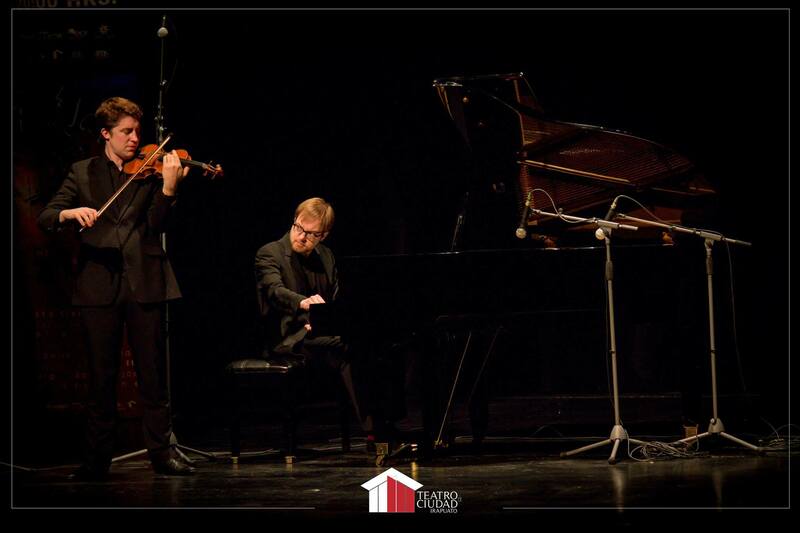 Michael performs with his duo partner Maksim Stsura in Mexico as part of their tour.